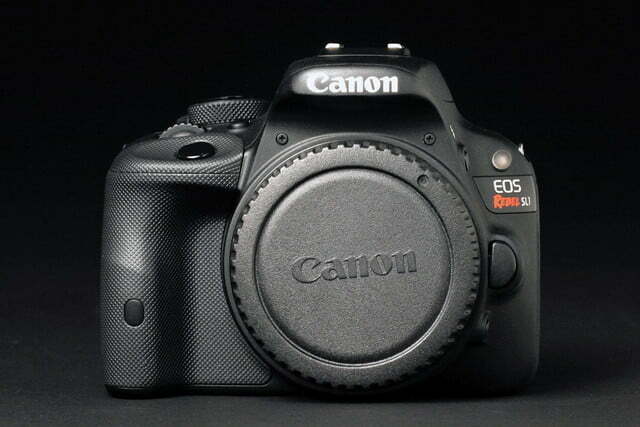 Canon DSLRs remain top sellers because they take good stills – and in the case of the EOS Rebel SL1 – good videos. The race to see who has the smallest Interchangeable lens camera continues. Pentax, Samsung, Panasonic, and Sony have introduced very small Compact System Cameras, while Canon’s EOS Rebel SL1 ($750, including an 18-55mm kit lens) is still the “world’s smallest and lightest DSLR.” We were quite impressed with Sony’s feathery Alpha A5000, the “world’s lightest interchangeable lens camera” as of early 2014; the even smaller Samsung NX Mini won’t be available for testing for some time, but the trend is clear – camera makers are desperately trying to compete with carry-everywhere smartphones. 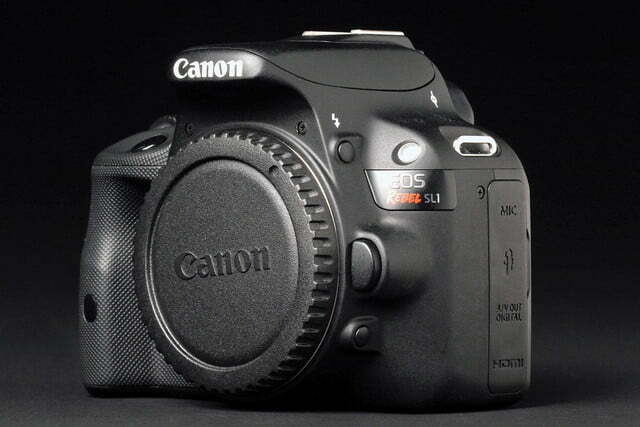 In the meantime, let’s see how the SL1 “baby DSLR” stacks up in this rush to get small. 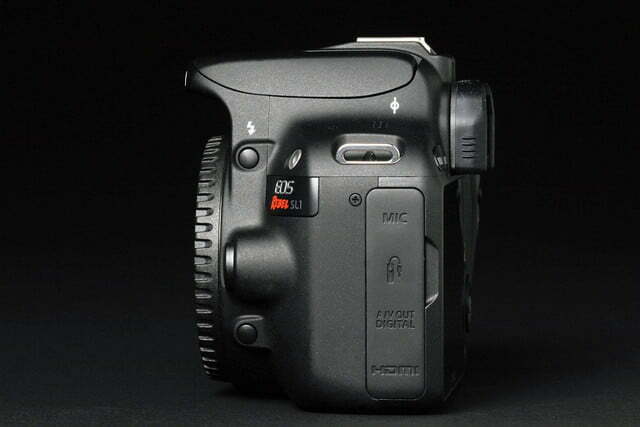 The 18-megapixel SL1 may be the world’s smallest DSLR, but by no means is it compact. 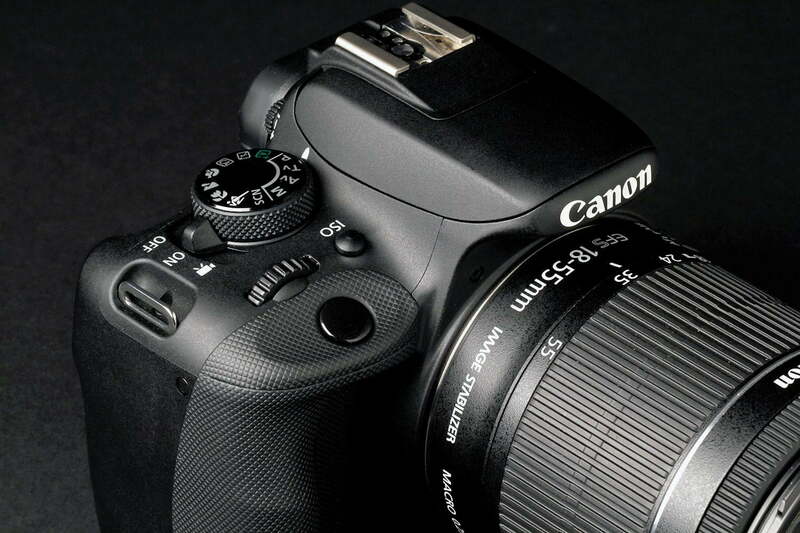 In fact, the 14.4-ounce camera is just 3 ounces lighter than the recently reviewed Nikon D3300; Canon’s own entry-level EOS Rebel T5 weighs 17 ounces. The SL1 measures 4.6 x 3.6 x 2.7 inches versus the 4.9 x 3.9 x 3 of the Nikon, and 5.1 x 3.9 x 3 for the T5. No question the SL1 is smaller and lighter, but don’t dismiss it just because it isn’t the same size as traditional DSLRs; it has just as much performance power as the bigger guys. When you’re lugging a camera around all day, every ounce – or lack of it – counts. When you put the D3300 and SL1 side-by-side with their kit lenses (the SL1 comes with Canon’s EF-S 18-55mm f/3.5-5.6 IS STM lens), you can definitely discern a difference in body volume but they’re almost the same length when you extend the zooms. 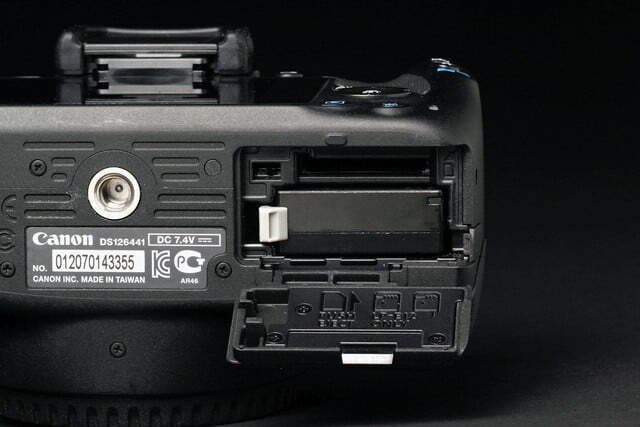 Give props to Canon for being able to build a more compact DSLR body. 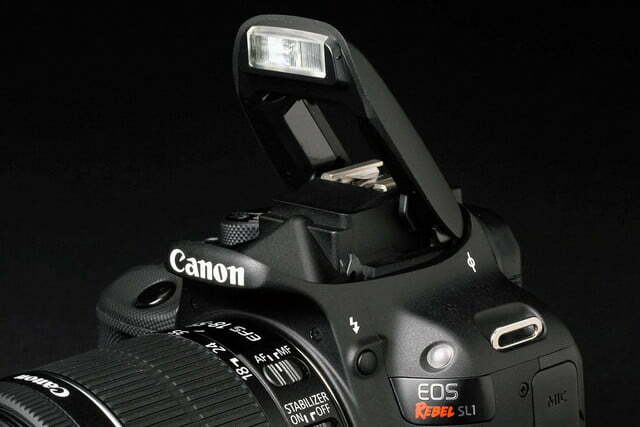 The key feature on the front of the Rebel is the Canon EF mount that accepts EF and EF-S glass; a quick glance at the Canon site shows close to 70 options, from $199 to 14 grand! 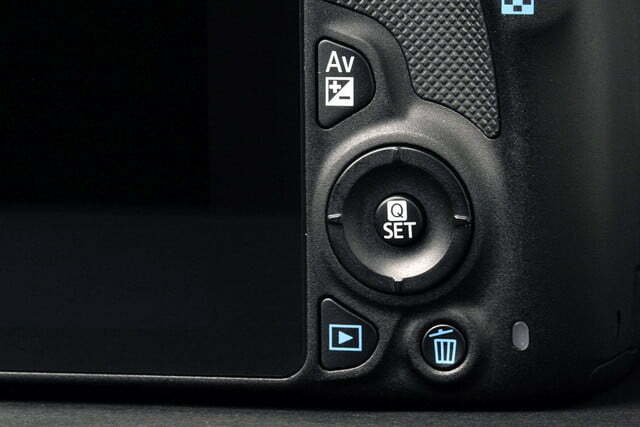 And this doesn’t count third-party options from Sigma, Tamron, et al. No matter your photographic vision, you have a good selection of glass to choose from. 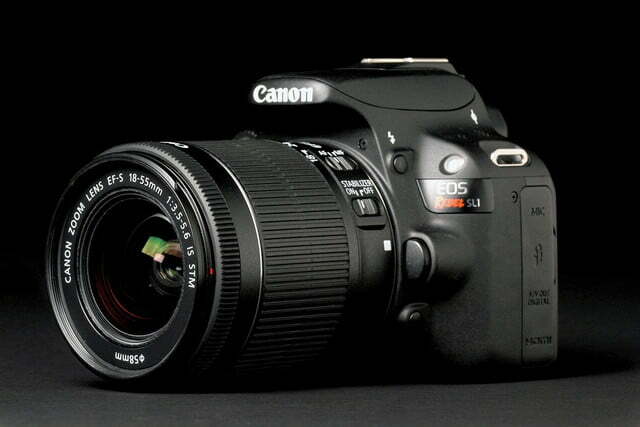 Don’t dismiss its small size, it delivers as much performance as bigger DSLRs. 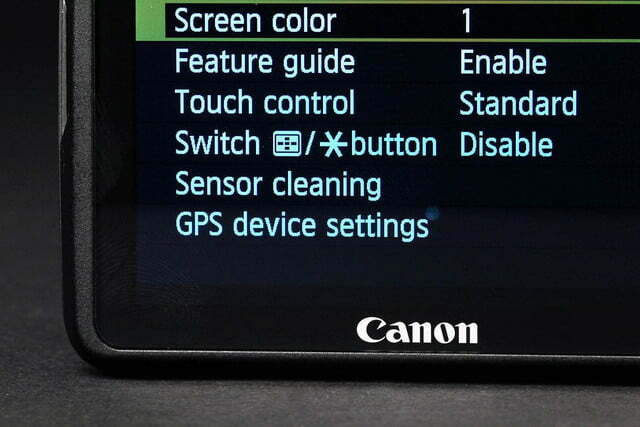 Like the Canon T5, the mode dial has options for beginners and sophisticated users, such as Scene Intelligent Auto, four dedicated scene settings (Portrait, Landscape, Macro, Sports), and more, as well as Program, Aperture Priority Shutter Priority, and Manual. We criticized both the D3300 and T5 for having onboard mono mic on the top-deck, and we’re extending that scolding to the SL1. We know manufacturers have to save a buck but why offer one-channel audio with Full HD video? Baffling that you can shoot video for your HDTV, but with sound that would match a tube you bought in 1970s. The saving grace is that you can use an external high-quality microphone. 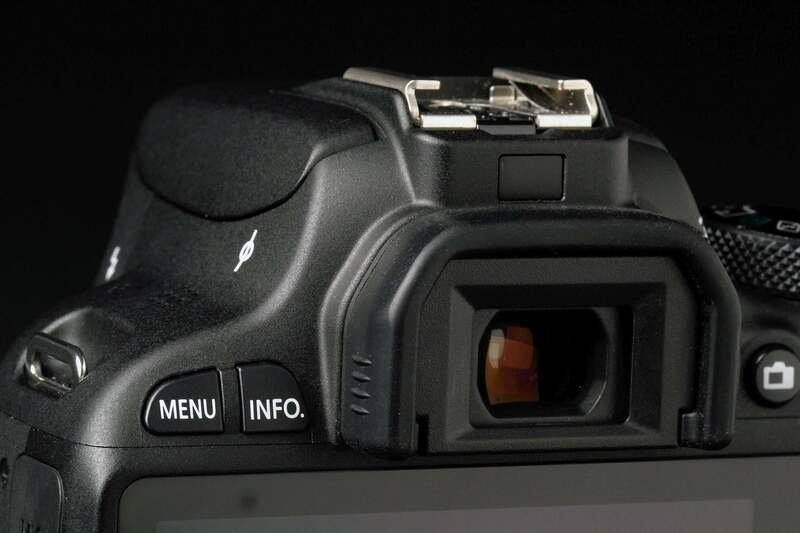 The SL1 has a solid rear LCD rated 1,040K dots. It’s touch-enabled so you can make adjustments with your fingertips and swipe through your images, among other things. Would it be nice if it could tilt or swing out? Most definitely, and the screen definitely had issues with direct sunshine even with the brightness cranked up. While shooting video, which puts you into Live View, we had to find a shady spot in order to frame our clips. This Just goes to show you can’t have everything, even if it’s a high-end feature. 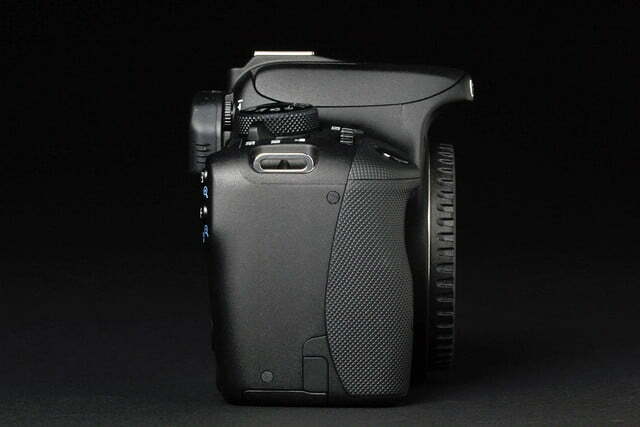 The optical viewfinder is slightly better than the T5’s, with a 95-percent field of view and .87x magnification. It’s not the brightest but readouts are quite legible. 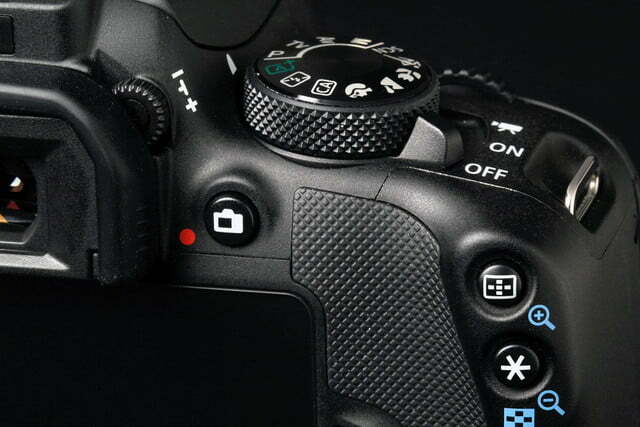 Along with a nicely sculptured and textured thumb rest, the back is home to the usual controls and buttons – Menu, Info, Live View, Exposure Compensation, AF Point Selection/Enlarge, AE and FE Lock/Decrease, Playback, and Delete. 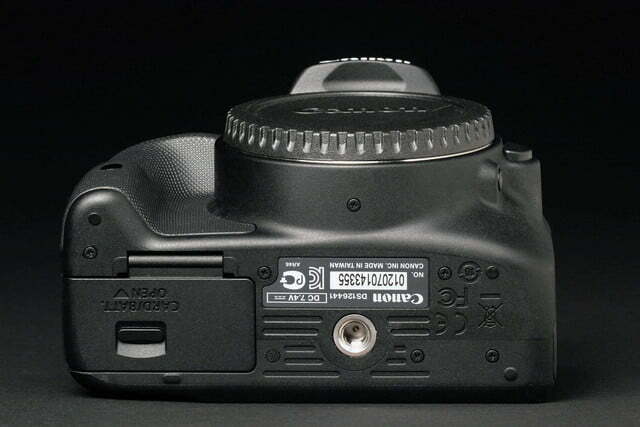 There’s also a small four-way controller with center Set button – everything you’d expect on a regular-sized DSLR. On the left side is a compartment with mic, remote, AV-out/USB (Digital), and HDMI connections. On the bottom is the battery compartment and slot for an SD card. Although the SL1 does not offer Wi-Fi, it does support Eye-Fi cards for wireless transfers. Read on for more performance specs. You’ll find the camera body, kit lens, USB cable, and various caps and a strap. There’s also a rechargeable battery and plug-in charger. The battery is smaller than the usual DSLR power pack so it’s rated 480 shots with the optical VF, 160 for straight Live View. 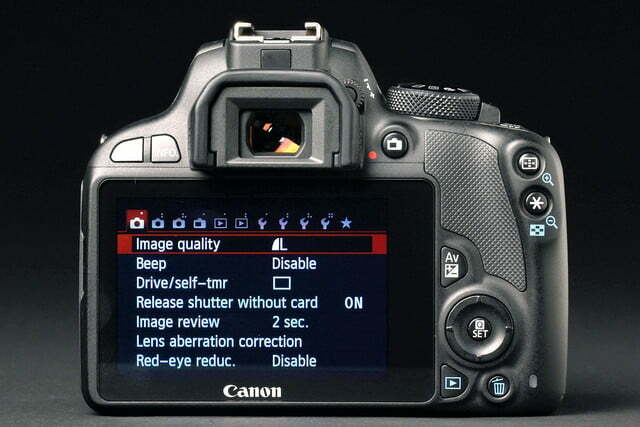 Although less than the T5, you should get in a day’s shooting with few issues. You also get a 116-page pocket Basic Instruction Manual and three CDs, the EOS Digital Solution Disk for handling files, a Software Instruction Manual CD and another with the full manual. Canon provides a limited one-year warranty. More details can be found here. Even though it has an 18MP APS-C imager, there’s no denying that the SL1 rightly claims the title of “world’s smallest and lightest DSLR.” However, we think this race to get small has some issues, especially for people with larger hands. 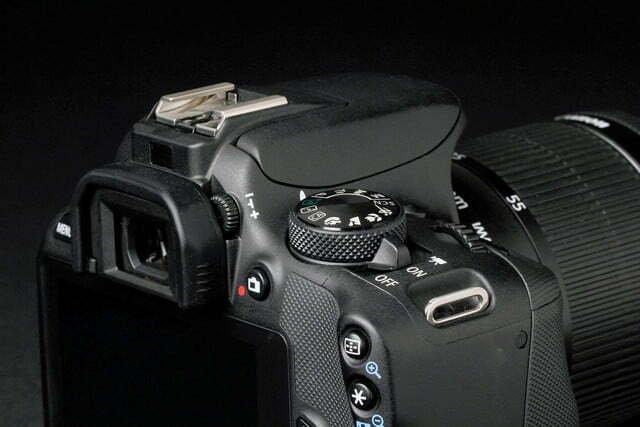 Most DSLRs have a grip that’s completely open along the entire length. With the SL1, it isn’t and there’s a hood over your fingers (see photos). Although we always urge you to do a hands-on before you buy any camera, it’s an absolute must with the SL1. Our fingers were a bit cramped and we’re hardly NFL linebacker size. Caveat emptor. Baffling that you can shoot video for your HDTV, but with sound like an old tube’s speakers. 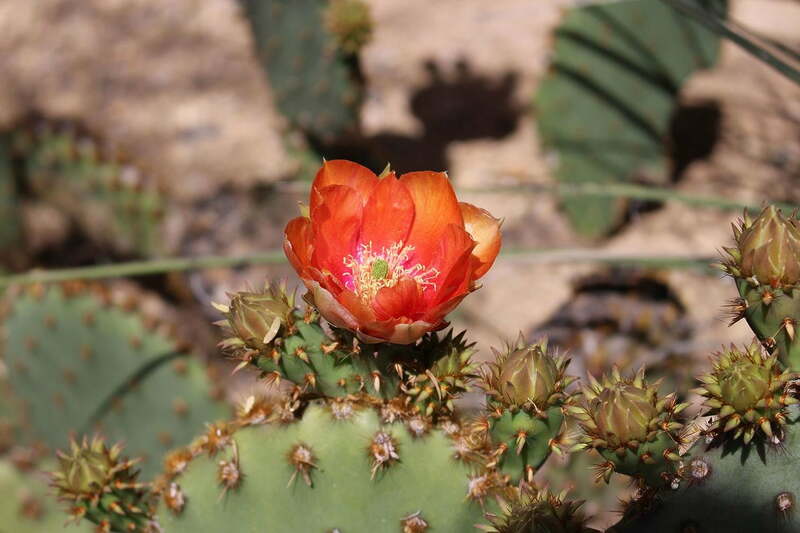 After charging the battery, we put the camera through its paces in various Arizona locales. We set it to maximum resolution for stills (5184 x 3456) and 1920 x 1080/30p for videos. 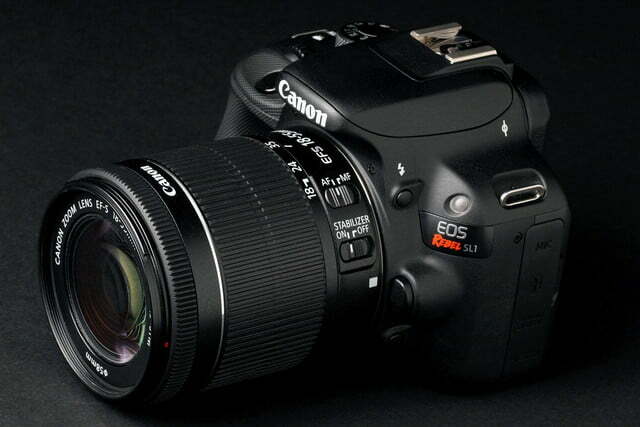 Canon supplied the kit lens as well as a 55-250mm f/4-5.6 STM zoom for our review. 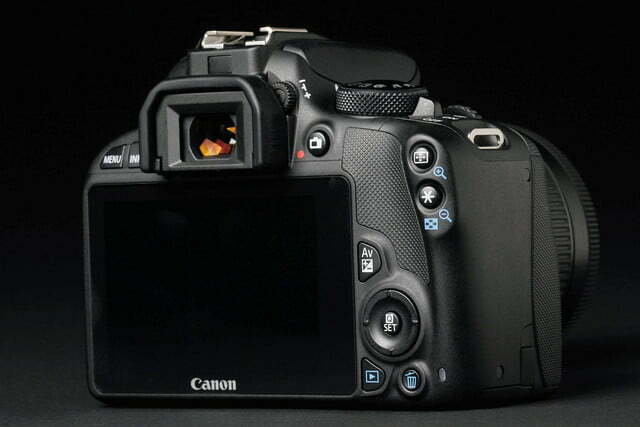 Two claims to fame for this DSLR are its improved movie focusing ability and higher burst rate. 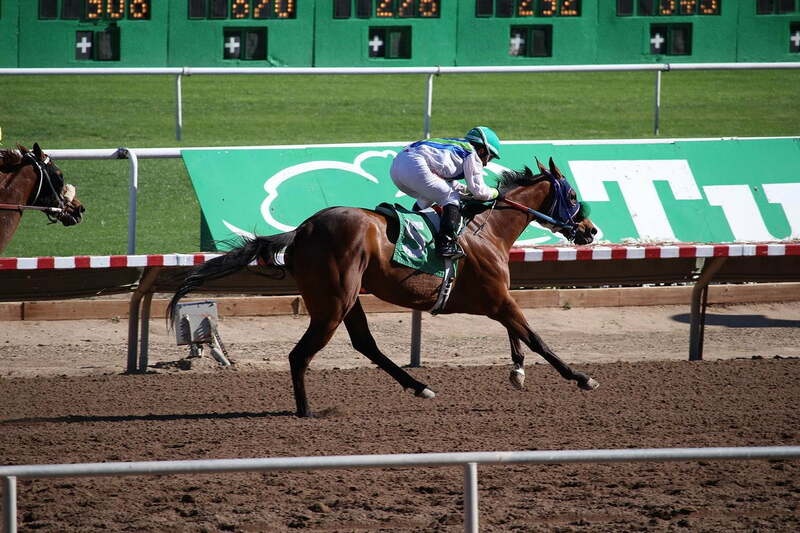 What better place to check this out then a thoroughbred race track, trying to capture horses zooming by at 25 miles per hour? As always, we have to give a nod to pro sports photographers who grab those super-sharp action shots you see online and in print. Our results weren’t nearly as perfect, but, then again, we weren’t using $5,000 bodies and $10,000 lenses. Movies we shot were quite good, with accurate color and barely noticeable rolling shutter. Overall, we were pretty pleased with our results (see samples). The camera’s 4-fps burst mode will definitely grab frenetic children and other types of motion. Realize there are limitations, as the top shutter speed is 1/4000 versus 1/8000 for enthusiast DLSRs, and the camera slows down after a 20-shot burst (shooting JPEG); Canon rates it 28 shots but ours slowed down before then. Even so, the stills had the nice, broad range of color we always like about Canon cameras. Movies we shot were also quite good. 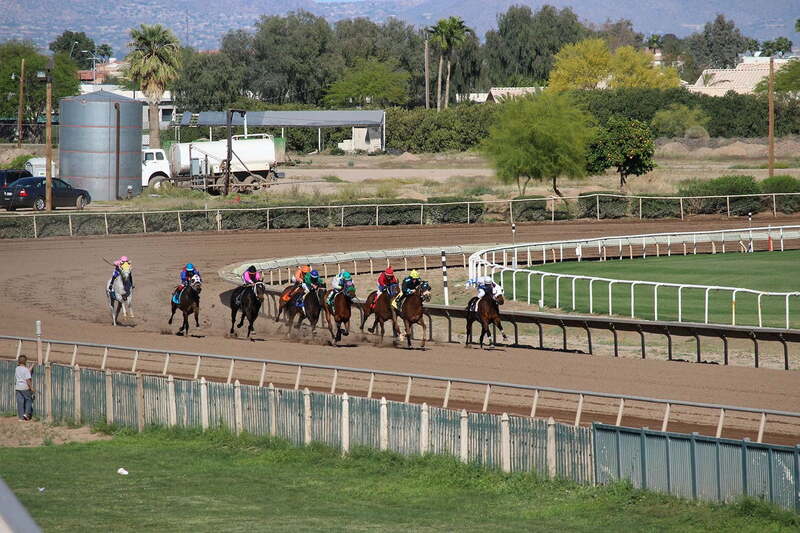 The Hybrid CMOS AF II system handled the field of horses turning and heading down the stretch. Color was accurate and rolling shutter was barely noticeable; however, there were occasional exposure shifts and the video wasn’t nearly as sharp as the stills. The 55-5250mm lens’ built-in image stabilization helped smooth out the shakes, and the STM system eliminated any mechanical zoom noise. Too bad it’s a mono soundtrack. On the plus side, Canon video quality has come a long way. 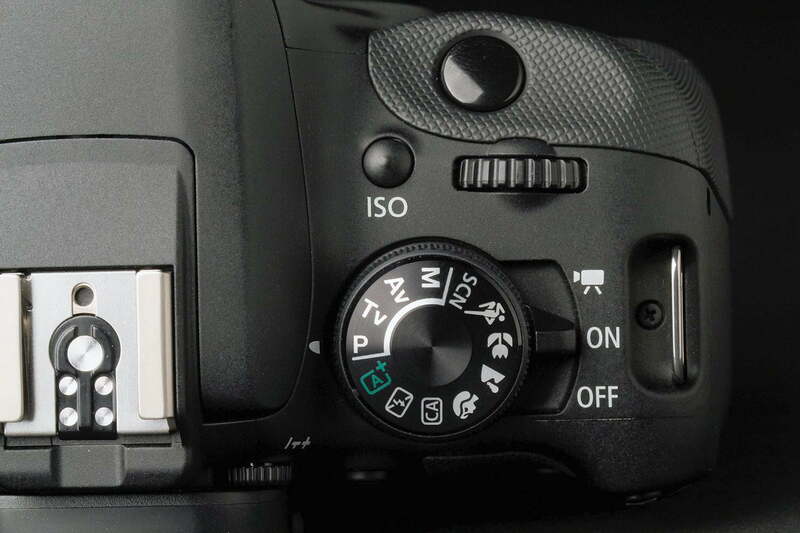 If movies are important to you, look for this focusing system or the Dual Pixel AF found in the much bigger and more expensive EOS 70D. 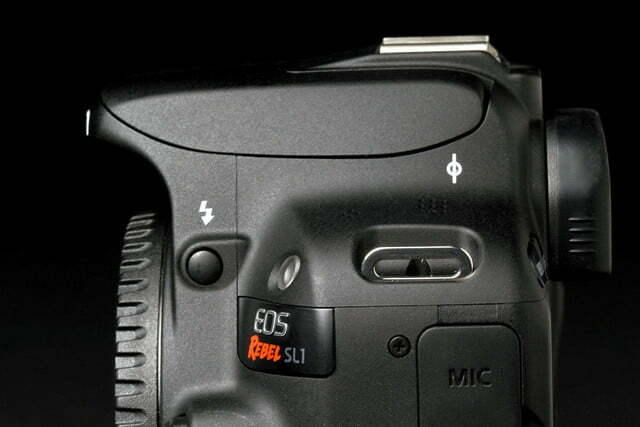 There’s not much more we can say about the results of the SL1’s 18MP APS-C sensor. 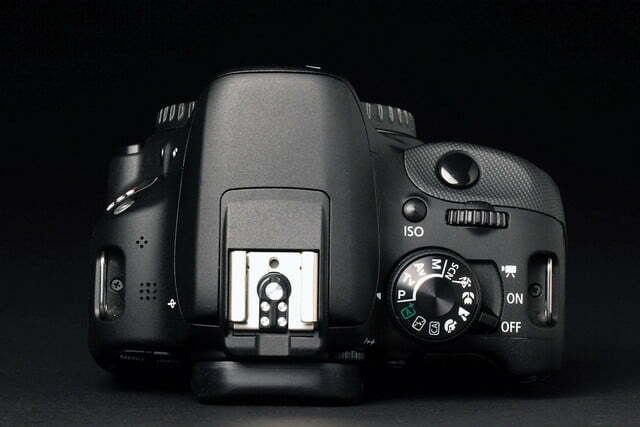 Canon has used it for years and the results are very good. 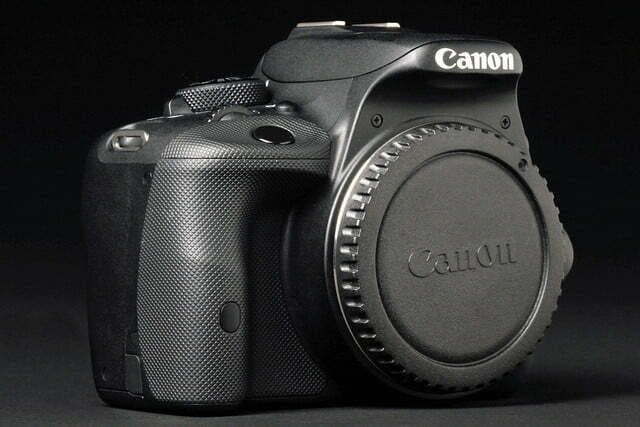 You won’t find the depth and richness of a full-frame DSLR but neither will you pay over $2,000 for just a body. At no time did we have focusing issues and Canon’s good-old 63-zone Dual Layer metering handled still exposures well. The SL1 has a native ISO of 100-6,400 but it can be boosted to 25,600 once you enable it via a somewhat obtuse menu system (there’s a reason you should read the supplied manual). Better yet, we’ll save you the trouble – don’t bother using this “H” level since quality is really bad. In our tests ISO was solid up to 800, then it started to fall off with noise galore and color shifts. You could get away with ISO 3,200 if the image was used at a small size. This is better than the new T5 but, in terms of high ISO performance, the Nikon D3300 is the winner here. The Canon EOS SL1 is a good DSLR, although a bit pricey – you can pick up a kit for $649 and $799 with an additional 55-250mm zoom. Yet, one of its main draws is its small size and it really doesn’t deliver on that score since it’s just a shade smaller than a classic DSLR like the Nikon D3300. And make sure you do a hands-on before you pull the trigger. If size is really important you can pick up a lighter 20MP Sony Alpha A5000 kit for $499. Even with all the issues, Canon DSLRs remain top sellers because they take good stills—and in the case of the SL1—good videos.